The following topics will be covered: (1) Challenges of Social Enterprises, (2) SE Prototypes That Get Funded, (3) How to Transform an Existing Business Into a SE, & (4) How to Get Funding from Venture Capital and Private Equity Firms. Who’s invited? Well, all social entrepreneurs are invited. Aspiring social entrepreneurs are also invited. And any kind of entrepreneur who is open to transforming their business into a social enterprise. All academia is welcome to join us. 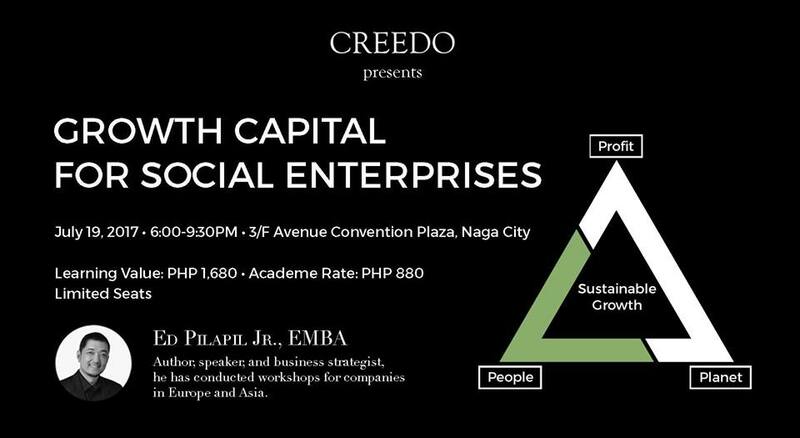 Interested parties may contact us at +63 54 8816745 or 0917 8987100 or email us at info@creedogroup.com. PROMO: First 50 people to register will only need to pay PHP 880! To sign up for the event, fill out the form below and follow instructions (also indicated below). Sign up for the Growth Capital for Social Enterprises Event here. Have you attended any Creedo seminars before? Check all that apply. I own a social enterprise. I own a business, but I hope to turn it into a social enterprise. I hope to have my own social enterprise in the near future. I just want to learn. I understand that this seminar and all learning points included are owned by CreedoGroup, Inc. Therefore, I hereby acknowledge that the learning event itself and/or any portion thereof may not be reproduced or used in any commercial manner, including formulating a workshop, without a written permission from CreedoGroup, Inc. except to improve and develop my business. 1. Slot fees are STRICTLY non-refundable, but transferable to another person. 1. After signing up, you will receive a Slot Confirmation email from admin@nagacityguide.com. Kindly REPLY to acknowledge and to confirm your registration. *If you have not received the email, kindly send a text message to +63 917 898 7100. *Slot Confirmation emails that are not acknowledged within 24 hours of signing up will become void. *If you are from GCF-NAGA, kindly mention it in your email. 2. Upon acknowledging our Slot Confirmation email, your slot will officially be reserved. We will then send a follow-up email containing payment details and instructions to settle your slot fee. 3. Upon receiving a slot for the event, you will be given 3 banking days to settle the fee, otherwise your slot will be forfeited.